The EF Duplicate Files Manager is a useful program that help you to find out and remove duplicate files with same name, same size, same content on specify paths, files that occupy so unnecessarily storage place on your computer or your server. You can let the program work in several ways. In the simplest case you let the program look for all files of same name. Or you give that only such files are to be specified in the result list, which exhibit additionally the same file size. 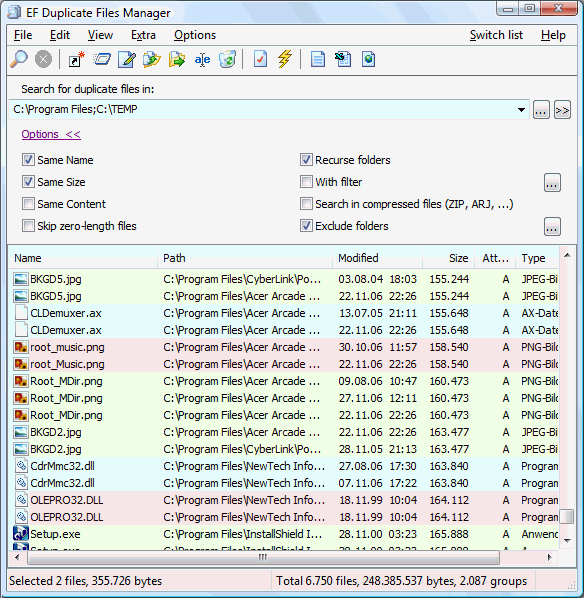 If necessary, the EF Duplicate Files Manager can analyze even the file content. It indicates then only dupes, which are absolutely identical. The EF Duplicate Files Manager looks if desired in multiple drives or multiple paths for dupes. Beyond that it is able to analyze the contents of archive files. The most usual formats (RAR, ACE, ZIP and much more) are supported as well as in image files (IMG, ISO9660). Further different filters are available, with whose assistance you can limit the search to certain file types or the date or size of the files. A exclude folder list does not make possible to be searched in this folders include their subfolders. This function can be used to accelerate the search procedure. Also important system folders can be excluded from the search, so that system files are not even handled, i.e. Windows backups. After the EF Duplicate Files Manager locked the search, he presents the dupes in a clear, polychrome supported list, found in accordance with the criteria selected before. The coloured representation makes a simple and intuitive recognizing possible of similar files. They can now decide, what you would like to do with the found files. The EF Duplicate Files Manager supports you here among other things with functions for the deletion, copying, moving or renaming the entries. Or you can save the list of the dupes found for later processing. The formats HTML, CSV or as plain text are supported. Smart PPT Converter 12.4: Convert PowerPoint to video - AVI, MPEG and more. Convert PPT to video files. Abex PDF to Text Converter 3.9: Extract text contents from PDF into TXT document Soft4Boost Audio Studio 5.1.9.241: Edit your audio collection with Soft4Boost Audio Studio. A-PDF Restrictions Remover 2.8.5: Remove password and restrictions of PDF files in a few seconds.